Want more home runs? Use the secret weapon of the pros. For most players, the hands are the weakest part of the body, limiting bat speed and reflexes. The pros know this and work this part of the body every day! 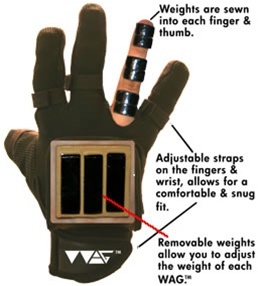 The Weighted Agility Glove, or WAG for short, is the only glove that works ALL sets of muscles in the fingers and hands by adding weight resistance to the fingers, as well as the back of the hand. The weights on the back of the hand are fully removable to set weight resistance at proper levels, depending on desired movement. The glove, designed by former professional athletes and coaches, was designed for better strength, quickness, agility, dexterity and articulation of fingers, hands, wrists and forearms. If you want to have the best hands on the field, in the gym, or anywhere sports are played, then you must train to have the strongest, quickest, most articulate and gifted fingers and hands. The WAG is the ultimate tool for training this area of your body. 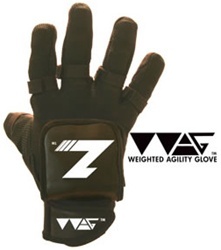 No other training aid matches the results of the Weighted Agility Gloves. WAG guarantees you'll have more bat speed, control and more success at the plate in 30 days of use, or, your money back! The most intriguing part of the design is the specially curved weights that go all the way down the fingers, which allows for constant resistance during any sport specific motion while allowing full movement of the fingers, i.e. dribbling, catching, rebounding, grabbing a hockey stick, baseball bat or tennis racket. With the fingers having full articulation, while having significant added resistance, the WAG's work all groups of muscles (extension AND flexion) making it the most useful and complete hand training aid on the market. It also allows for better hand balance than current gloves on the market which only have weight on the wrist, or, back of the hand, as the WAG distributes the weight more evenly across the ENTIRE hand surface. Gloves with weight in only one area of the hand (on the back of hand or wrist) do not allow for all muscle groups to be properly worked. 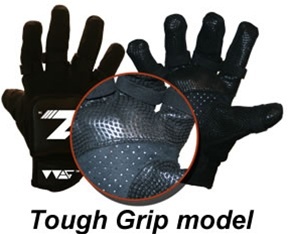 Therefore, grip strength is significantly enhanced by the WAG's over other products on the market, because the design allows for all muscle groups to be worked, and worked more evenly. "After using the Weighted Agility Gloves™ for 4 weeks, Carlos Rojas hit his first home run in 8 years of big league play. He is hitting the ball immensely harder than he ever has and I know there is a direct correlation between the use of the gloves and his rapid increase in power, because that is the only change in his training he made during that time period. There is no doubt this product has had a great impact on his improvement." "After using the Weighted Agility Gloves™, my players felt muscles in their hands, wrists and forearms that they never knew they had. I feel the WAGs™ will be an instrumental training aid for our program." - Gene Schults, Lansing Kee HS, most wins in baseball history (1500 career wins). "There is NO question that we have seen a difference in hand speed with our girls. We use them daily in the batting cage to develop speed and power." - Robb Digiacomo, Monroe CC Head Softball Coach, 2006-2007 National Champions. Sizing Note: The Men's gloves do run over sized, so please size accordingly (i.e. if you normally wear a men's large glove, you may wear a men's medium in the WAG™.) The gloves should fit snug, so when in doubt go with a smaller size.